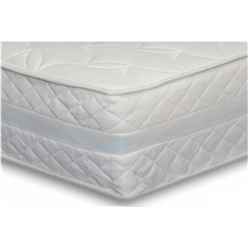 This mattress is manufactured to the highest of standards using high-quality foam-encapsulated pocket springs. Its combination of 3 inches of memory foam and 7 inches of a premium 1000 count pocket spring unit provides real durability, comfort and extra support for the neck and back. Its high quality components give extra levels of support by maximising the use of all the individually-pocketed medium-gage springs, each of which works independently. The mattress is finished in a soft removable quilted cover which is washable and therefore extends the life of your mattress.